Repayment Protection Insurance is an insurance that lenders sold on loans, credit cards, hire purchase and mortgages. It is meant to cover your repayment if you are unable to through accident, sickness or unemployment. However over the last 10 years most lenders have mis-sold repayment insurance. There are many ways it could have been mis-sold. And you will have paid thousands for it. Even if you agreed to take it- We can claim it back! If you’ve had repayment insurance on any finance in the last 10 years we can claim it back for you. 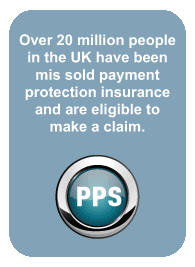 We are an experienced Scottish based PPI claims management company. So if you would like to reclaim your repayment insurance premiums CALL US TODAY. On average we reclaim our customers £3500.